All good news: there are still eight ducklings, all are in good shape, and they’re eating well. Further, the new waterfowl “starter food” I got is consumed readily, if not as eagerly as mealworms. Honey likes it too, and it’s so small, and spreads out over the water so readily, that every duck gets some, including the widening Frank. I have a feeling this 25 pounds won’t last the whole summer! This entry was written by whyevolutionistrue and posted on June 2, 2018 at 2:30 pm and filed under ducklings, ducks. Bookmark the permalink. Follow any comments here with the RSS feed for this post. Both comments and trackbacks are currently closed. I believe this now makes you a duck farmer. When you buy in 25 lb. quantities or larger it’s official. I don’t think that bag is going to last the whole summer. Remember, they’re growing. They will eat more and more as they get larger. And the larger they get, the more they’ll eat… that cycle won’t stop till the last duck quacks and flies away for the season. Perhaps you should set up a Go Fund Me account? But shouldn’t they learn to forage for other food and not necessarily be fed like farmyard ducks all summer? Or not? They do plenty of foraging when I’m not feeding the. I’ve watched them. In the morning as I come in they’re usually foraging in the grass. I was on campus yesterday for my 40th Reunion Dinner (at the Oriental Institute). How did I get to be so old? Unfortunately, traffic was so horrible that I could not make it to the Botany Pond before dinner. And we did not leave until 9:30 pm. I will have to make a special trip to visit Honey and her brood. Approximately what time are the feedings? They vary. Anywhere between 7:30-9 a.m. and between 1:30 and 3:00 pm. Have you considered moving them into your apartment? Get an inflatable plastic pool for your living room! Yes, I’m kidding. Look at the website for Mazuri/Purina. 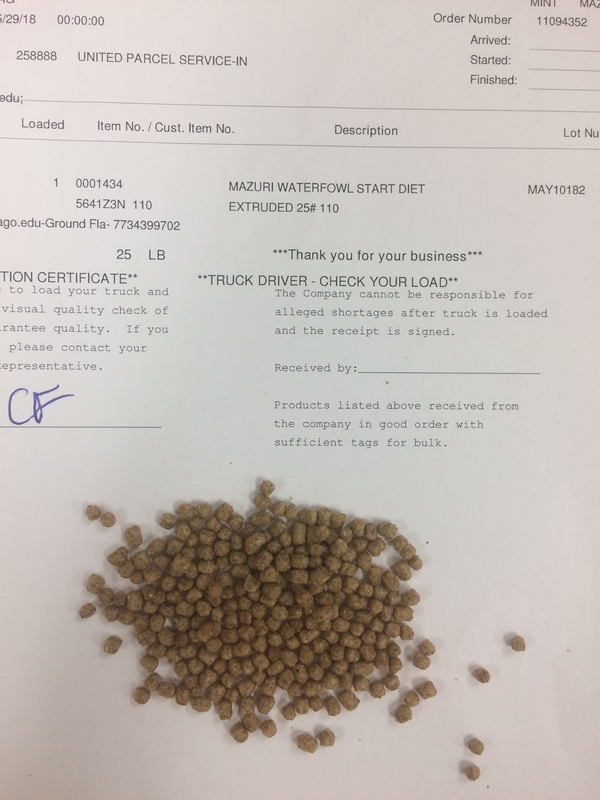 The pellets are only 3/32″ in diameter. Thanks for the correction Linda. I hope all your mammals are content, fairly tidy & not too troublesome! How is the cafe venture doing? The mammals are all fine, kids are growing, milkers are producing, equines are getting out into the pasture every day now. And, of course, the cats still rule the place completely. The restaurant is going gangbusters. Summer is upon us, so we have tourists coming in now, plus we will be hosting a crew from Netflix for the next few weeks, plus the Hotshots are rotating in from other parts of the west to be available in case of fires, so we’re feeding them daily, too. Our new oven went in this week, and I love it. That is the last of the upgrades that the health department wanted, so we heaved a collective sigh of relief. Come in for a blueberry muffin or a brownie, or a full meal if you’re ever in town. Thanks. Glad all’s well. You are on my list for a visit down in the SW once I get back to walking & such [2019 I suspect] – I will not do it sooner because airline travel is a wheelchair nightmare. I tried a ‘hop’ from Birmingham [UK] to Prague for a grandson’s stag & the journey was ‘orrible – airlines don’t ‘do’ wheelchairs well. What’s NetFlix up to? A secret new Breaking Bad or Better Call Saul spinoff perhaps? I have no idea. I don’t pay much attention to that stuff, as I don’t have time to watch anything anyway. Our little town is sort of frozen in time visually, so we get a lot of movie crews in here doing mid-20th century stuff because there’s not a lot of revamping needed. It’s enough for me just to keep them fed. What happened to you Michael? I must’ve missed the thread about your condition. Speedy recovery! I had an above-knee left leg prosthesis [artificial leg] since 1977, but the stump swelled up overnight around Christmas & the docs are still figuring out why. Can’t wear prosthesis for now & can’t use crutches for various reasons [mainly cos weak right knee]. Some of this debris is the bone/teeth remains of other people so I think there might be a severe reaction going on with my immune system working overtime to reject foreign biological material – hence swelling. Why it’s acting up so much after 40 years? I think an unrelated infection in December, treated with antibiotics, put my immune system on the back foot. I’ve avoided ABs for years knowing how they can bugger up a balanced system, but foolishly I listened to the docs this time! They told me “new AB”, give it a go. Stupidly, I listened. What a hassle. Yeah, getting an infection probably woke up your immune system. Come in immune system, lay off. You’ve done your job, not take a rest. Wow. My reply was messed up. I’ve been having some cognition issues with a migraine trying to come out but I think that was just all fat fingers. Anyway, I hope your health improves soon! I don’t care about a bit of bad spelling – I knows people with migraine & I’m very glad it went past my door without knocking! I do hope the docs get your leg figured out sooner rather than later, Michael. Must be quite painful. Go body go in getting rid of the bad bits and bringing back the good ones. I do enjoy your entertaining and informative posts! Thank you. 🙂 No pain at all. I’m getting better by returning to my medication-free policy [I don’t have any conditions that must be medicated]. Looking good! Raising the pond level has made a perfect duck bath. I suspect human intervention means all eight ducklings will survive now, (unless the heron comes back or something like that). I worry about the heron, too. Should have ordered the 50 lb bag since you are a professional! That looks pretty good – I’ve only had them, & their kind, raw [survival training 45 years ago]. I’m coming around to the idea of insects [arthropods] for protein. Frying the little buggers, after they’re dead of course, seems to be the way to go. I reckon that by 2040 eating lamb chops will be laughed at as unsustainable nonsense for old geezers. The French menu & other foodie delights will be a very, very expensive indulgence for wealthy people. Embrace your inner locust. Crunchy. These Paris gastronomologues are delightful! Very happy to see the ducklings doing so well! I was amused by the cat footprints on the bag of waterfowl start diet! I do hope that no cats try to munch the ducklings…. Also loving the duck-dates. Thanks! You’re a wonderful person, I hope you know. What sort of ingredients are in the pre-prepared foods? Maybe one could try them by themselves too.